The Better Start Bradford Community Board members bring a wealth of experience to support our aim to give our Bradford children the best start in life. None more so than Christy Bischoff, who has travelled the world working with families and fortunately for us found her way to Bradford! I was born in Kentucky, US, which really is in the mountains of the coal mining community. I grew up in Missouri and I went to University there and studied Early Childhood Education. I always thought I was going to be a teacher because my mom was a teacher, but when I did my student teaching I decided I really didn’t want to be a teacher! I think teaching made me aware that what I really loved was the emotional, social, and behavioural side of working with children. So at that point I decided that I wanted to travel and I joined a global volunteer organisation and went to work at Quaker Cottage, a cross community family centre in Northern Ireland. The advert for the role stated, ‘helping children develop through play’, which really struck a chord with me. The programme was based in West Belfast and all the families that came there were referred by social services for all kinds of reasons, such as issues with paramilitaries, addictions and depression. I spent two years working there. 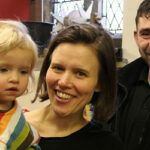 I loved the ethos of the place and it cemented in me a commitment to working with families. I had the privilege, years later to write my MA dissertation on the impact that the programme had and I got to interview quite a few women that had been part of the project. A theme in the interviews was many of them saying things like ‘they just showed me love and nobody ever has before’. The programme was very much relationship based and it was hard work, but there was real transformation. They were some of the most amazing children I had ever met in my life and I really loved them. Northern Ireland has a very special place in my heart. I then spent a few years back in the USA doing outdoor education type of things, but after working in Northern Ireland, I was really interested in peace and justice and I joined an organisation called Christian Peacemaker Teams which supports non-violent groups in the US and abroad. I spent a year going to Palestine and returning to the US to talk about it. One time I spoke about Palestine at my grandmother’s church and someone from the Rotary Club came up to me and said ‘we have a scholarship to study peace studies and conflict resolution’. It was one of those random encounters that shift your life dramatically and the deadline was only a few weeks away. I applied for the scholarship and I was successful. There were seven universities and Bradford was one of them. I’d never heard of Bradford before but geographically (in my mind) it was nearest to Belfast! I loved being a student and there were people from all over the world at the University. However, the thing I loved the most was getting to know Bradford and pretty quickly I started volunteering at Bradford Action for Refugees and that’s where I work now. We have two children, Micah and Alma. Micah is seven and is in year two at All Saints and Alma is four and in nursery at Russell Street Nursery. Micah does flexi-school, which means he goes to school part time and we home educate him part time. I really appreciate that the school has allowed us to do this, as it works really well for us. I think one of the things that feels most important to me is raising my children in a way that they respect and see the importance of building bridges and relationships with a wide range of people here in our local community in Bradford. 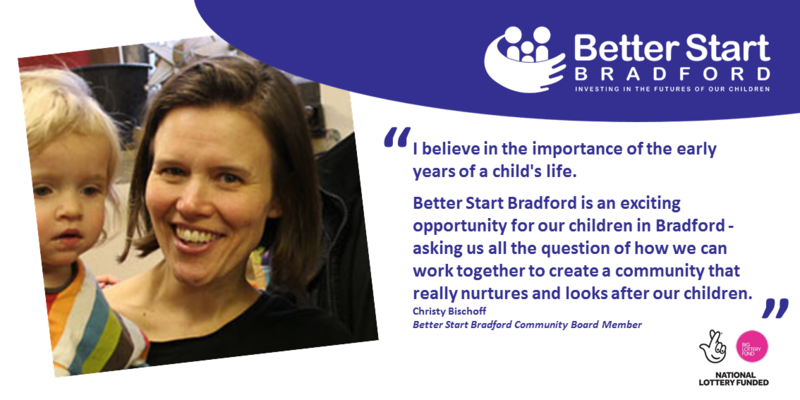 I became involved with Better Start Bradford three years ago because I believe in the importance of the early years of a child’s life, and it seemed an exciting opportunity for our children in Bradford, asking us all the question of how we can work together to create a community that really nurtures and looks after our children.